Ever fancied spending most of your Easter bank holiday swimming at Guildford Lido? Then this is the event for you! The challenge: swim 1 mile, on the hour, EVERY hour for 24 hours. Simple. The sun dance worked and the weather was on our side- a forecast of beautiful sunshine and warm temperatures during the day (although the clear skies meant for a chilly night). I was really looking forward to catching up with some friends, some who were supporting and some who were swimming solos and relays. We put our tents up on Friday afternoon and it was fantastic to pitch with the rest of the Tri Surrey team, Stacey, Martin, Pete and Jem as well friends Kosh and Neal and our friend Tasha. 7am Saturday morning and I left to drive to Guildford via Starbucks, arriving far too early but with plenty of chatting time. The klaxon sounded at 8.55 and we walked to Lane 1, meeting our lane buddies for the next 24 hours. The lane consisted of myself, Stacey Angliss from Tri Surrey, Tasha Morey, Hayley(whom I had swum 100x100m with last December) Andy, Niall and Chris. The 7 of us started out strong and stayed in a train for the first mile. As the day and night progressed, we differed in pace but everyone made sure that someone else had a pair of feet to swim on! The day was stunning, the sun was strong and the miles ticked by nicely. Mark came down with the boys and they played with Tasha’s daughter. It was good to see them knowing I was in for a long night! My routine remained the same. 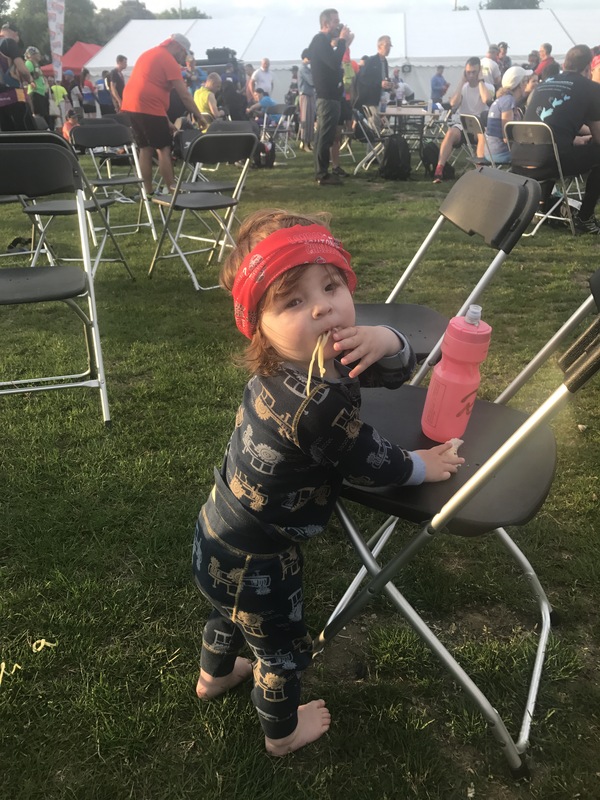 Swim, get out and dry off with a towel/change costume, put on towel/dry robe, make a drink and grab a snack from the tent, sit on camping chair on poolside and post photos of chosen snack on Strava, reapply suncream, get ready to go back in the pool. This routine worked well and I felt great. My pace was dropping off from 25 min miles to 26 minutes and I was losing the feet of the people in front. At first this bothered me, that I was the weakest link and couldn’t help the others, but I soon realised that we were in it as a team and even though I was regularly finishing behind the lane, everyone stayed standing at the end to welcome me in at the end of the mile. Just before the 8 pm(12 mile) swim I had a bit of a low. Maybe it was the sun going down; maybe Mark turning up and a rush of emotion; maybe the white chocolate milkshake….whatever it was I suddenly felt very sick. I let a little bit of panic rise up and felt my emotions take over. I got in the water and just concentrated on not being sick in the pool and eventually the feeling went away. It however took another 2 hours of just having water and green tea to stop feeling bad. It was a relief to put my wetsuit on after 12 miles…I was starting to get cold as the sun had gone down and it made a difference to have a safety blanket! The whole lane were motoring along beautifully…I was struggling to keep hold of feet and so found myself on my own for a fair bit. This did mean that I added even more time onto my mile without the effects of drafting but I was happy enough and didn’t swim slower than 27 minutes for a mile. Niall was an amazing person…he was quicker than the rest of the lane and so lapped me around the 800m-1000m mark. He would overtake me then slow right down so I could sit on his feet. He would stay there for the remainder of his mile, just dragging me round. It almost brought a tear to my eye at how someone could be that selfless and I hope that I can help someone out in the same way someday! Niall would also be the last person from our lane to leave the pool, waiting for us all to finish and then for us all to get out- true sportsmanship. I decided to go and try to sleep in my tent after mile 15 so at 11.35 I crawled in and lay down. I slept almost instantly and was dribbling when Mark shouted 7 minutes to go until the next swim! Having the sleep had felt good so I decided to do it again after the next mile. I stuffed a bit of food down my neck and slept again at 00.35 until 00.53! Miles 17-20 were tough but I treated myself to the heated marquee. It sounds like a fantastic idea but being warm and snuggly makes getting into the water so hard!Plus, sitting on a plastic garden chair at 2am when you just want to sleep is like torture! Tasha was doing amazing. I only found out after the event that she wasn’t intending on doing it until I had text earlier in the week when I saw her name on an email. Then she was only going to do 12 hours. She completed all 24 hours with no wetsuit and completely looked after me in and out of the water, especially in the last 3 miles. Champion. I kept eating little bits after each swim and the night was a bit of a blur. I decided to lay down in my tent again at 4.35am. The sky was still black but as I lay down I heard the most glorious sounds; birds singing… dawn was coming! As I crawled into my tent again at 5.35am the sky was getting light- it was an amazing feeling but I was still so exhausted…only 3 more swims to go. I looked at the hot tub longingly as we lined up for mile 22. Stacey told me she was going to sit in it after mile 23. I thought this was an amazing plan and vowed to meet her there! Mile 23 and 24 were just about getting the job done. Tasha was suffering with cramp as she pushed off the wall and said she was staying with me. We took turns to lead 200m each then rotate round. It was the most lovely feeling to know that we were in this together and, although I knew that my swimming speed was much slower than hers, she was unequivocally going to be with me until our last stroke. The last length of mile 24 was wonderful. Tasha and I were trailing nearly 100m behind the others and swam side by side down the final length. I could hear people clapping and cheering, their support flooding the poolside. As we reached the end of the length, the rest of our team were waiting. handshakes and high fives at the ready. Someone suggested a group hug and we all bundled in. I’m not usually one for a group hug but there was something very special about looking everyone in the eye with the full appreciation of what we had all gone through. The highs and lows, be it at different times, were all very real and we all knew what it had taken to get us through the last day and night. The benefit of being the faster swimmers meant we got first dibs on the hot tub and piled in! It was just so glorious knowing we didn’t have to swim again. Soon it was back to real life and everyone was taking down tents, getting dressed and saying goodbyes. Mark and I had separate cars and managed to drive to Mark’s parents for an Easter egg hunt with the boys before I passed out for a few hours. The sleep deprivation is tough and on Monday evening I’m still catching up. The shoulders are sore but relatively ok. My face is peeling- senstive skin and 24 hours of chlorine, sun and suntan lotion doesn’t do it much good! Be organised with your kit- put your hat and goggles in the same place. Hang up wet gear and have your warm stuff ready to go. Be prepared to be flexible. Change your food, clothing, pace- it doesn’t matter as long as you keep swimming. Mark- He said when I had finished that I could have done it without him but I honestly wouldn’t have wanted to- even just having him sitting beside me was a comfort and none of this would be possible without him. Stacey, Martin, Neal, Kosh: seeing your resilience after each mile was inspiring. Stacey, when you looked at me wide-eyed at some point in the middle of the night I thought you were going to cry and tell me how much your shoulder hurt. Instead you looked like you were going to cry and questioned how on earth you were going to get a brush through your matted hair!! It made me laugh so much! Martin- as much as we very rarely take you seriously, you battled some serious demons and the smile on your face after you put your wetsuit on was the biggest relief! Neal and Kosh- kudos for going non-wetsuit, Kosh for continuing with innuendos and Neal for throwing up at the end- you left it all in the pool…and the bin. All the other soloists including Sheridan, Kate, Jason and probably others I have forgotten. I am so thankful for your friendly faces and chat- you continue to inspire me in what I do. I can’t remember the exact moment that the idea of entering the ArchtoArc popped into my head but it had definitely been dwindling in my sub-conscience for some time. Mark completed it in 2012 and the journey he went through, at the time, seemed incomprehensible. When he completed it, he had the record for the fastest and the first person to complete the swim without a wetsuit (Mark still has to fastest swim time of 11hours 47mins). It was simply nuts. Fast-forward 6 years to summer 2018 and I announced that (I think) I wanted to do the ArchtoArc. The ArchtoArc consists of a run(87miles) from Marble Arch to Dover; Swimming the English channel; Cycling 181 miles from Calais to Paris. I’ve compartmentalised the event so much that just writing this is making me feel a bit sick! I’ve got a lot of training in front of me and, although swimming is my main strength, it is the part of the challenge I’m most nervous about. I have faced some demons in the Channel and I struggle mentally with the long distance swims so to go back will be a challenge to say the least. Since announcing that I will be doing the ArchtoArc in 2020, I have found it interesting that so many people have asked me when I will start training. I’ve spend a proportion of the last 8 years challenging myself in endurance sport so, to me, this is an evolutionary next step that will require huge amounts of training but hopefully with a little bit of experience behind me. To date I have completed 15 marathons (pb 3hrs 27), 23 ultra marathons and 2 iron distance triathlons(best time 11hrs 47mins). I have swum 2 x length Lake Zurich(26km); 2 x Lake Windermere (10.5 miles); Lake Annecy(15km); Lanzarote to Fuerteventura; 4 English Channel relays;1 x failed English Channel Solo(aborted 200m from French shore due to fog after 14 hours) 1 x English Channel Solo(12hrs 24mins) and Jersey to France(3rd fastest ever crossing at the time 6hrs 50mins). 2019 should hopefully see me tick off some more marathons and ultras (round Guernsey and the Autumn100 entered so far); Austria Ironman and a channel relay. Most important of all I am looking to remain consistent in my training. For so many years I have done events based on some pretty sporadic training and although my fitness has risen and my mindset has become pretty relaxed, I have also got injured and struggle to recover from the events that I probably wasn’t quite prepared for! My aim is to do less events and keep the training strong and consistent, slowly ramping up the distances and run-swim bric training. I have also started back at Dynamo Boxing(Hard Fitness) with Adam Wright- he got me ready for my first Channel swim and I was bloody strong so I have a lot of trust in his ability to get me strong again! Since having Bodi nearly 3.5 years ago I have done very little strength work so my core needs a lot of work!! I was VERY nervous about this event. 3.8km swim, a 3 lap very hilly bike and an off-road marathon over 4 laps. I have had an odd year in terms of training after injuring my knee early on in the year at the Pilgrim ultra. Since then I have completed a couple of marathons, a 100km run and Man vs Horse (22 miles cross country). I’ve done a couple of 100 mile+ rides and some swimming (although I realised not over about 3km in one session since the beginning of the year!!) All of these events were completed with a small amount of trepidation and some knee discomfort; I haven’t really felt ‘fit’ at any point this year but have relied upon my base fitness, some muscle memory and a big glug of resilience! I hoped that I could complete the Bastion in around 13- 14 hours; 1 hour swim, 7 hour bike, 4-5 hour run. The race started at 6am and at 5.15am I was nervously prodding my bike and chatting to Lucy and Michael who race for Bayliss Multisport Team and are coached by Stephen and Bella. Both had an amazing race and Lucy won the women’s for the 3rd consecutive year and Michael got an excellent 3rd. Suddenly the race organiser came into transition and shouted that it would be a non-wetsuit swim as the water temperature had risen to 26 degrees. A huge grin spread over my face; I hadn’t wanted to swim in a wetsuit as I had been so hot at the lake recently. As a swimmer I am more comfortable without a wetsuit but as I looked around transition, no one else was smiling. Nervous and weaker swimmers would rely upon a wetsuit for buoyancy and this could potentially mean a much slower and more tiring swim for these people. At 6am we entered the beautiful lake at Hever Castle and swum to the start buoys. I eyed up the more confident looking swimmers hoping I could catch a ride on their feet. The starter horn went off and I swam hard. The field spread out quickly and I soon found myself leading a small group with another few swimmers pulling away from me. From about 500m into the 2 lap course I stayed in the same position. I could see a couple of people way out in front and when I looked behind I was leading quite a big group. This group slowly dwindled off the pace and I made sure that no one was going to come round me. After 1 lap I had 4 people on my feet but the rest of the field had dropped way back. The swim was beautiful and spectators were able to stand on the bridges and cheer as we swam underneath. At the end of each lap there was a short river section that was so full of weeds and green river-stuff that I had to clamp my mouth shut and try not to ingest any pond life. 200m to go and I had just one person on my feet so I gave a kick and dropped him so that I had a clear space to get out of the lake. A marshal helped me up the ramp and I ran under the beautiful arches into T1. I had swum a 1.08 which is alright considering it was non-wetsuit and this was the furthest I had swum in months! I was 5th or 6th out of the water overall and 3rd placed woman. End of lap 1 and I had averaged 16.2 mph in a time of 2hrs15. Great, this would give me a few minutes buffer on the next 2 laps to get in under 7 hours. How wrong I was!! The 2nd lap started to sap the energy from my legs. My knee had started clicking and hurting so I kept my gears really low. I ate and drank and ate and drank but I was really struggling. At one point I felt great and thought I had got a second wind, but that soon left me. I decided that I was going to stop at the aid station just over halfway around the 2nd lap and use the toilet. I wasn’t desperate for the loo but I was desperate to get off my bike and stretch my back and my upper body. I also hadn’t worn my tri suit to cycle in before and was struggling with the thinner chamois. I felt a relief when I started the 3rd lap knowing that each metre of tarmac I rode over would be the last time I rode it today. Unfortunately, I was completely worn down by the previous 2 laps and struggled to keep up my cadence even on the slightest inclines. The positive news was that my knee had stopped hurting- probably shocked that I had kept on hammering it! There was not really any flat on the course; it was either up or down. In previous laps the descents were glorious and a chance to stretch my legs and feel some speed; on the 3rd lap they took up as much energy as the uphills and my fatigued shoulders and neck meant that I couldn’t stay in one position for longer than a few minutes at a time so I was constantly changing from the hoods, to the drops, to my aero bars just trying to get some comfort. My average speed had dropped from 16.2mph on the first lap to 15.5 mph and the third lap saw it continue to drop to 15mph. My garmin was set to just show the time of day and I was glad that I didn’t have the constant reminder of how comparatively slow I was going. The final 20 miles felt like they took forever… the second half of the course was full of short sharp inclines that sapped all my energy. During the final few miles a lady came up behind me. She was taking part in the aqua bike and was also finishing her bike leg. We chatted for a few minutes and it completely took my mind off the pain that I was feeling…a short conversation had really come at the right time. I felt nothing but relief as I turned left to head in towards transition. I hadn’t even thought about how I was going to run a marathon but plodding very slowly is my forte so I knew as long as my knee held up I was going to be ok. The bike had taken 7.5 hours- longer than I had anticipated but still giving me 5 hours to complete the marathon and get under 14 hours overall. Riding onto a grassy bank, I wheeled my bike to T2 where it was taken to be racked and I entered the tent. I didn’t think sitting on a wooden bench could feel so comfortable but it was bliss to know that I didn’t have to be sitting on a bike saddle any longer!! I faffed around and took about 5 minutes putting on suncream, socks, shoes then trying to decide what combination of cap and sunglasses to wear and whether or not to put on calf guards. Instead I used them to wipe the sweat from my face as I stood up and prepared myself to run out of the tent and onto the marathon course. The run was 4 laps of just over 10km. It was so so hot outside and I knew that the first thing I had to do was get my body temperature down. At every aid station there was a bucket of water and sponges and I drenched myself at every possible opportunity. I completed the first in 1hr 15mins…I had been spurred on by going past the girl I knew was in 3rd place and who unfortunately ended up DNFing. It wasn’t long however before another girl came past me and I was back into 4th. I completely lost my pace for the next 3 remaining laps. The course was beautiful; a gravel path led up a hill and then a grassy path ran around the lake followed by some stints through woodland and a few corn fields. The run wasn’t easy but it was a typical trail run and I would have liked to have run it with fresh legs! I was very thankful for the flat coke that I had drank at the 3-4 stops per lap… it was the only nutrition I had but totally did the job. Nearly everyone around me was in a similar state. I ran through the finish straight at the end of lap 2 and Michael, who had finished in 3rd, cheered me on and shouted “1 more lap!”. I corrected him that I had 2 more laps and it dawned on me that it could mean nearly another 3 hours!! Once I was halfway round my 3rd lap I felt happier. Mark had dropped the kids with my mum and was busy running round the course in reverse; I think a lot of runners got to know him quite well! He told me the news that with 1700m to go to the finish, he had timed Lucy as 1min 10seconds behind the leading girl and he had told her to sprint.. he hadn’t known the outcome but we found out that Lucy had got the win by 6 seconds and this made me very happy and spurred me on! The final lap was fine. I knew I would be finished soon and tried to enjoy the experience as much as possible. Although painfully slow, I managed to keep a sort of jog going and when I came into the finish line was completely ready to cross it! Medal presented, it was 8.30pm-14hrs and 31 minutes after starting at 6am. It was all a bit surreal finishing and I just wanted to get home. Mark and I had driven separately so I had to drive home and managed to take a pretty funky route in my tiredness. It has taken me most of the week to start to recover and all thanks to my mum who had the kids on Sunday and Monday night so that I could have a lie-in. As always, Mark dealt with my pre-race panicking (which went on for weeks ) and generally picked up all the pieces and said all the right things at the right times. Would I do it again? Yes, but not next year…I would need to be very ready for it and make it a stronger race. In a week and a half I will be getting round The Bastion triathlon at Hever Castle; 3.8km swim; a hilly 180km bike(10,000ft of climbing); and a trail marathon run. Physical training has been sporadic due to injuries but I’ve done plenty of nuts events so have ensured the mental training has been ticked off! Since 2002, the African Village School Fund project has been a true labour of love for the founders, Rob Nestor & Lynn Frusher. After being selected for a reality TV series by Channel 4 , the Nestor-Frushers, along with their three children Daniel 13, Chloe 8 & Callum 4 years old, relocated to Swaziland in January 2001. Embarking on an 10-week adventure, the South London family settled in the village of Ekudzeni, homestead of the Shongwe family. They gave up many of their material comforts, and had to quickly acclimatise themselves to their new surroundings. The family lived in a hut with a thatched roof; without running water or electricity. They altered their diets, bathed in the local river, and lived without the modern convenience of public transport. The closest school was more than five miles away, requiring a two-mile walk to the bus stop in order to attend. Though the family experienced acute culture shock, they grew to love the village and the people. The Nestor’s wanted to help and support the community who had welcomed them, guided them and shared their lives with them. So in 2002 Rob returned to Swaziland met with the Elders to ask what they needed and came home to commence fundraising for a tractor. African Village School Fund was born. Today, Rob and Lynn return to Ekudzeni at least once or twice yearly, in order to visit the projects and people in which they have invested nearly two decades of their lives. Obviously, with time, huge improvements have been made. Building the primary school encouraged a local bus route to start running regularly, the pre school is the only one for miles in this rural community, the indoor kitchen in the Home of Hope now enables cooking to be done comfortably in all weathers ,the homestead now has electricity although Mungo’s is still waiting to be connected, local people have found employment with AVSF and the Shongwe’s have become part of our family. What started out as a frivolous adventure turned out to be an amazing, life changing experience. Giving any money to this charity would hugely benefit them. This was my 3rd consecutive year taking part in the L2B ultra and, after having a cracking year in 2017 clocking 12hrs 24, I was a bit more dubious about what the day had to bring. Having been out for about 10 weeks with a knee injury, I did what every Physio probably recommends and eased gently back into my first run- the London Marathon. Knee felt ok so I did Milton Keynes 2 weeks later. Knee fine, I started Cranleigh trail marathon 6 days later. Ok, knee now not so fine so I opted for the half marathon option at the end of lap 1 of 2. Ultra training… tick. I’m sure that was plenty enough miles! 2 weeks after Cranleigh and I was standing at the start line in Old Deer Park in Richmond alongside fellow Tri Surrey member Peter Starnes. The day ticked along quite.nicely; Pete and I ran together and chatted and the miles just zoomed by. At around 30km in we were joined by Sophie and Ian, also Tri Surrey members. Ian was on car support and the plan was for Sophie to run with Pete until halfway and then perhaps over the South Downs towards the finish. It was great to have an injection of pace from Sophie and it freshened up the run. This was the first time I saw Mark and the boys and they continued to follow me, often quite literally down the road, all the way to Brighton. By the time we got to 40km however I was beginning to overheat- the sun had broken through the haze and the day was heating up. I knew I needed to spend a bit more time at the 40km checkpoint in Outwood so let Pete and Soph go on and stayed a few extra minutes to guzzle some coke and squash and get a cereal bar down. I was really hot running out of the checkpoint and, already at marathon distance, was starting to feel my lack of consistent training creep in. I generally felt ok in mind, which I’m happy about because my head usually goes before my body! At about 50km I had to leave some new running friends and stop to stretch my calves… cramp was creeping in and I felt like they could spasm at any second. I needed salt. 6km to go to the next stop and it was agony. I jogged and walked but my head had blown to smithereens. I txt Mark to tell him I was going to pull out at Tulleys(56km) … his reply, although sympathetic, did not accept my decision. When I got to Tulleys, the first person I saw was Ian and it was such a relief to see a friendly face… I walked through to the marquee and Sophie was waiting; she informed me that Pete had struggled with cramp too and was currently getting a massage. Well, Pete and I had previously had a conversation about taking pleasure in other people’s misfortune and I’m guilty to say that knowing he was suffering too took the edge off my own suffering! Sorry Pete! I scoffed most of a bag of salt and vinegar crisps and went in to give Pete some in the massage tent. I stuffed some dry roasted peanuts in my bag for the walk. I still wasn’t feeling all that keen on continuing the race and wanted to get out and away from the checkpoint as quickly as possible. Pete said he would be about 15 minutes longer so I decided that I needed to make my way out. The race continued in peaks and troughs. My legs had well and truly deteriorated and any running I was doing was a proper shuffle… this was a worry with over 40km to go. Thankfully the demons in my head generally stayed on good behaviour but I was just finding it physically very very tough. My core muscles were tightening and hurting and my chest and breathing was really tight, probably due to the stinking cold and cough I had had for the 3 day run up to the race. At one point about 65 km in, I climbed over a style and just sat down on the grass the other side of the fence. I don’t think I’ve ever just sat down in a running race but I was just exhausted and no amount of food or drink seemed to be helping. Through the Ardingly checkpoint(67km) and Mark had txt to say they were in a cafe on the waterfront of the Ardingly resevoir. When I got to them, Mark asked if I wanted and ice cream. An offer I couldn’t refuse! I sat in the shade with the boys whilst Mark ran and got me a twister. Having anything cold was heavenly even though I was having to fight off a 2 year old Bodi who was eager to share Mummy’s ice cream. Having cooled down slightly, I carried on up the hill. I had one more sitting down incident where I saw a bench that had my name on it; I sat and swung my legs back and forth, taking great joy in the simplicity of sitting down! Eventually I got to the Wivelsfield checkpoint(80km) and saw Mark, Sophie and Ian. I was broken but in my head I knew I just had to put one foot in front of the other. The next 20km was a blur of painful shuffling and walking and I didn’t want to do anything at the Plumpton Checkpoint(87km) except grab some water and a banana and get the hell up and over Ditchling. I got talking to a girl who was a class runner, probably running a couple of minutes a mile faster than I had been but, being a marathon runner she wasn’t used to the distance and she had stopped for ages at each checkpoint so had only just caught up with me. It was great to have company up Ditchling and she tried to get me jogging along the ridge with her… I lasted just a few minutes but she was far too quick for me so I ushered her on. Another climb and a txt of encouragement from Jenny made me cry- I don’t think I’ve felt that desperate in a race for a very long time; I was digging deeper than I thought I could but there was no other option but to keep moving on. The final hill from Falmer station took ages but I didn’t care… I knew that once I got to the top I just had a 2 mile flat section and then the racecourse would appear, like a mirage, across the other side of the road. Mark was waiting for me at the road crossing to the racecourse and I nearly burst out crying. Indie was asleep so we arrange to meet in the car park which I was fine about- I didn’t want to hang around any longer than necessary! I dragged my feet round the racecourse towards the finish- it seemed to take an age but eventually I heard the cheers and finally, finally reached the line in 14 hrs 12 minutes. I smiled, said thank you, accepted medal and t-shirt, took 2 sips of prosecco and threw the rest on the grass as I walked straight to the waiting car. I’m not sure what I felt- mostly exhaustion; some relief that I had finished; a sense of satisfaction that most of the emotions I felt were due to complete necessity to dig to my deepest guts. Pete battled some massive bouts of cramp and no doubt had to dig twice as deep to get the the finish in just under 17 hours… absolute kudos to you. Sophie and Ian were amazing and, as always, proved themselves to be the best support crew around! Mark and the boys are my world and to have them there was invaluable; the ice cream, the high-fives and the little cuddles from Indie with a reassuring “well done Mummy, you’re doing really well”, when I was crying on a roadside… well… nothing can beat that for motivation. The only spanner in the recovery works was the Vitality Westminster mile the day after- probably the most pain I had felt all weekend. Feeling like I had the worst hangover in the world married up with being hit by a bus, and then chasing Indie round a 13 min mile was my limit… I deserved my afternoon nap!! Thankfully Mark Sheridan has written a wonderful blog (link below) about our experience swimming La Bocayna Strait on 27th December 2017. My husband and I have been together for nearly 14 years and our relationship has evolved to the point where it is a perfectly normal thing to buy each other surprise race entries for birthdays and anniversaries. It’s Mark’s 40th this year so I decided to tick another one off the bucket list and entered us both for the Midnight Sun Marathon in Tromso, in the North of Norway, in the Arctic circle. It is a June race and I booked the trip in November which is a really long time for me to keep a secret. There were a few worrying moments when he nearly entered the South Downs 100 miler the weekend before but I kept my cool and only broke a few weeks before the race when I decided I had better give him a heads up on the marathon, in case he wanted to taper or something.2 flights later and we arrived in Tromso on the Friday afternoon. 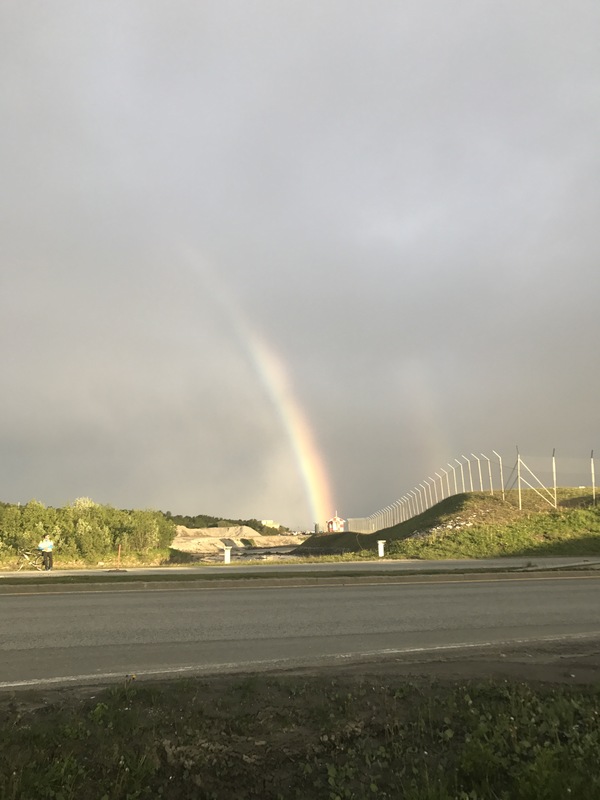 It soon became apparent that nothing in a Tromso is much more than a few minutes walk away and that most tourist destinations could be done in a day. The race would start at 8.30pm on the Saturday night. We went straight to the pasta party which was taking place in the hotel we were staying at and met a few other British runners. One couple had been in Tromso for 3 days. The girl in the couple was a new runner and nervous that she wouldn’t make the cut off whilst the boyfriend, having spent 3 days touring Tromso, had decided that he might as well join his girlfriend and run the marathon of which he had entered that day! We saw him during the race, he had left his girlfriend behind and was running pretty well… we hope relations resumed amicably after the race :-). Saturday started with a hotel breakfast of all the buffet food we could eat followed by a ‘breakfast run’, a friendly 1km jog to a local bar which served a free breakfast. We made it a bit of mission to get free food on this trip as it could be eye-wateringly expensive e.g. £9 for a small glass of wine or £20 for a baguette… we soon clocked onto the fact that pizza seemed to be quite a cheap option and that if you picked the right places, it didn’t need to be extortionate. 8.30pm seemed a lifetime away and we spent the day looking around the museums. The polar museum is probably one of the most oppressive places I’ve been in a while; a study of the history of Norweigan trappers with very lifelike exhibitions of seal cubs getting axed and baby wolves getting caught in viscous metal traps, I made a note to myself not to being the kids to this one unless I was to completely traumatise them. Finally 8.30pm came around and we walked the 2 minutes to the start line. We started close to the front and went off too fast, completely ignoring the fact that we had both agreed to never go under 7.55min/mile. The first mile was 7.25. The second mile included going over the huge bridge that links Tromso with the mainland so that would slow us down and average out. 7.26. Oops. 7.42 for the third mile and we then settled down along the straight out and back, South then North back to bridge. I became aware of a lady in pink running right next to me and our strides were very similar. We got talking to an English guy, Tom, who was hoping for sub 3.30. We got to the turn point about 10km in and had dropped into a comfortable 7.50 pace. I had nearly dropped my phone whilst trying to take a selfie going over the bridge and once again nearly did a comedy juggling act as I attempted to take another photo of the view. The lady in pink, who had remained by my side, broke the silence between us and asked in broken English if she could take a photo of me. I denied her offer but we got chatting. Her name was Alex and she was Austrian; she had done 3 ironman marathons but this was her first fresh marathon and she was hoping for around 3.15. I told her that I was aiming under 3.30 and the man behind us who had been a bit chatty but was struggling gave an incredulous snort at the realisation that he may have gone out a bit quick. Alex and I remained at the front of the group with Tom, and Mark dropped behind with chatty man and quite a few others. The race was starting to spread out so it was nice to have the company of everyone around us. We passed the bridge and did a little loop which involved a pretty sharp but short hill before running onto the bridge to cross back over to Tromso. This was the halfway point and I felt really strong and we had been running a really consistent pace. There were a few huffs and puffs around us and we dropped a few of our group but remained with Alex and Tom. We ran through the town, it was now nearly 10.15pm and everyone was outside the pubs and bars in town cheering us on. The support so far had been incredible with everyone outside their houses chanting ‘hey ja, hey ha!’ This was really uplifting and all we had to do now was to run round the perimeter of the island in a ‘U’ shape in an out and back. At about 16 miles I felt the inevitable deterioration begin. I ushered Mark on with a gentle push on his shoulder and dropped behind him. I expected this feeling of fatigue to last but as I kept a check on my pace, I realised that I was still running 8min/mile pace. Right. I can do this then, I’m going to keep going as close to 8 min/miles as I can until 20miles and then see what happens. I caught Mark back up at about 20 miles. I was feeling the tiredness creeping in and grabbed a cup of maxim and one of water at the aid station, walking 10-12 paces with them making sure I got the liquid down me. Mark was clearly struggling with muscle tightness and had really slowed. Tom was with him and it was now their turn to usher me on. I felt a sudden spurt of energy and slowly pulled ahead. With just 4 miles to go I was going past people and sticking close to 8min/miles. I started doing the maths about my finish time, I was pretty certain I could get in under 3.30 but it wasn’t a given. A girl came up on my shoulder, I hadn’t seen her behind me last time I looked for Mark so she was really speeding. Instead of going past, she stayed next to me and we slowly increased the pace, using each other’s metronomic stride to keep going. With about a mile to go, Mark came up beside us. I was shocked that he had recovered and got himself back to me but so happy that we would be able to finish together. The last mile was tough and with half a mile to go I could barely feel my legs, I was doing everything to keep moving forward and suddenly I saw the bridge which indicated the start of town and probably only 200m to go to the finish. As the finish line came into sight, I had to bite my lip to stop crying; I glanced at my watch and saw 3.27 as the distance ticked over 26.2. We ran down the finish straight to the cheers of the crowd and finished in 3.27.58, a pb of exactly 10 minutes from 10 weeks ago at Brighton. Tom arrived a few minutes after us and as I glanced at my phone I realised it was exactly midnight; pretty cool. I had envisioned finishing and having a beer in an outdoor bar whilst cheering others on, getting a bit tipsy and eventually crashing into bed. In reality, we crawled to the hotel bar; Mark had a beer and I, shivering, had a coke. I had only taken a few sips of my drink before announcing that we needed to go the room where I promptly puked then had a shower and, still shivering, crawled into bed fully clothed in my down jacket. It took me a few hours to actually sleep, my stomach felt awful and my legs were so painful, it’s been a while since I buried myself this much! The next morning I woke up and found I could walk a lot better than I could the night before. We decided to jog 2.5miles to Telegraph Bay to have a quick dip in the water. For once, I was the one motioning for Mark to keep up as his calves remained in concrete-form. The beach was just beautiful, how often do you have grassland, sand, cool clear waters surrounded by snow-capped mountains? Our dip last about 1 min but made us feel very fortunate to be in such an amazing place. Although the trip has been quite a luxury, I would so thoroughly recommend it; the race was perfectly organised, the precision of the race planning was masked by the friendly and relaxed manner by which everyone was made to feel at ease. The aid stations, marshalls and the cosmopolitan mixture of runners just made the race such a pleasure and I wouldn’t hesitate to come back if the opportunity arose. Thanks to MSM for organising an incredible race in an incredible place. Midnight Sun Marathon, Tromso, Norway. This would be my second consecutive year running from London to Brighton. 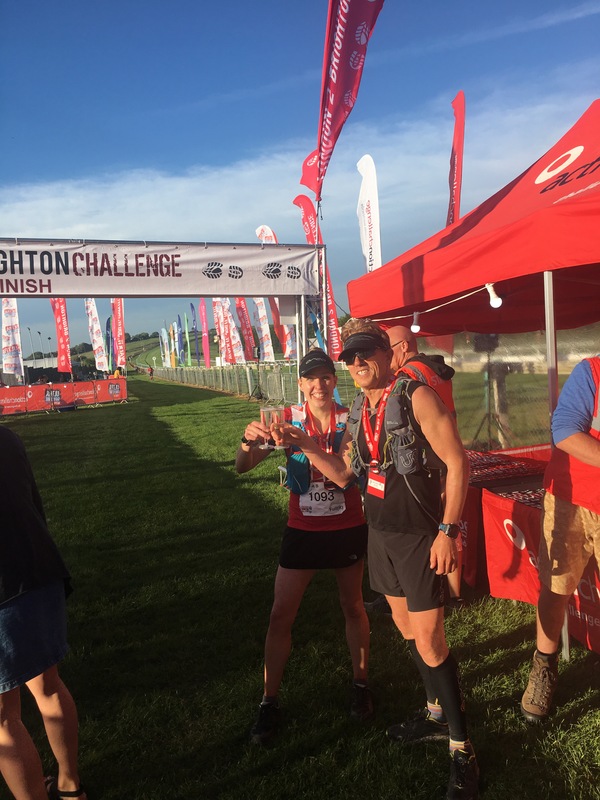 Last year was my first 100km run and although it was one of the toughest runs I had done, it was pretty iconic to travel from London to Brighton and this year I felt like I was in good running condition to have a crack at well-paced race. The logistics on race day were simple; Mark, along with both kids, drove me to the start in Richmond at 7 and then followed me along the course for most of the day, picking me up and taking me home at the end. I love that my kids are so used to these morning adventures that they have no problem running around a field in their pyjamas at 6am! I met up with fellow Tri Surrey member Matthew and, without too much hanging around, we were off. My strategy was to run no quicker than 9.45min/miles as I have a habit of going out a bit too quick and deteriorating pretty early on in most races! It felt so slow at first and I had to force myself to continue keeping an eye on the pace as hoards of people ran past. The first section of the race is along the Thames Path and so is dead flat and very runnable, the route then turns in towards Surbiton and the first of 7 checkpoints. I felt good and ran through the checkpoint, grabbing a banana and some water to have as I jogged. I was wearing sunglasses and a sleeveless top but it was really warm and I was feeling the heat. As if someone from above had heard my plea, the heavens opened and we had a brief but very heavy shower; it was blissful. As we continued climbing through Nonsuch Park and towards Oaks Park, the 25km checkpoint and where my in-laws live and would be cheering from, my stomach began to protest. My first feeling about this was annoyance; I usually would only have stomach issues if going out too fast or not drinking enough but I had been very careful with both of those things and didn’t feel like I deserved to feel like this! At this point I had a few walking breaks and shortly, in a bit of a grumpy frame of mind, jogged into Oaks Park to a cheery family. Grumble grumble, I collected another banana and had a dash to the portaloo. My stomach was indeed a bit of a mess and it wasn’t until I was discussing this with Mark after the race that he admitted having a bad tummy that day too and that it was likely we had both eaten something the night before that was bad. At least I can blame it on my bad cooking not on my bad pacing! To be honest, the next 25km didn’t get much better and I was annoyed at my own pessimism which just made me more grumpy. I think this was all internal, I was happy to try and have a friendly chat with fellow runners and there were a few nice moments over Farthing Downs where I walked with a few different people. Just after Farthing Downs we emerged into Chaldon where Mark was waiting for me with the kids; this is about 1.5 miles from our house and I leant into the car window, the feeling of relief if I could have just got in and driven home was tangible. I quietly moaned to Mark, asking for his advice, wanting to ask if I could withdraw from the race and go home, but needing him to tell me to crack on. He didn’t need to say anything; out of the window my 3 year old yelled “just go and run Mummy!”. I had been told, off I jogged. I had a decent little spurt after this and ran into the next checkpoint ok. Unfortunately this didn’t last long and I walked out of the checkpoint, once again reassessing and downgrading my expectations. As I approached the Outwood windmill, I saw a familiar kit sitting on a bench. It was Matt and he was withdrawing from the race. He had had difficulties with training and today was not his day, he had run over a marathon and should be very proud to have got to the start line and completed what he did. I feel awkward admitting that I took a bit comfort from his demise but I kind of did- it gave me a kick up the backside to get moving and to get motivated and to take control of this run and make it a positive experience, after all the reason I run these races is for a feeling of challenge and enjoyment, not to beat myself up the whole way. Soon I was jogging again and reached 56km checkpoint at Tulleys Farm. Many people stopped here to change socks, eat, have a massage but I wanted to keep moving so grabbed a banana and some water and jogged straight out. Soon after leaving I found myself running with another guy and we soon got chatting. Almost instantly the pain and negative thoughts melted away and were replaced with positivity and mindless chat. Sean and I chatted about ironman, running, holidays, family and kit for the next 6 hours and I am so grateful for his company. I really don’t know what else to say about the second half of the race because I forgot I was running for most of it. Sean and I got a move on when we were running and our pace was back to 9-10 minute miles with walking breaks at most inclines. We would naturally take turns to call a walking break but had a slight communication breakdown on one particular hill where we both thought each other was going to call a walking break and we both toiled up this hill, both having internal conflicts about why the other had not called it before I gave in a begged for us to walk. Checkpoints came and went and Mark and the kids continued to follow us along the route. The final hill came with about 12km to go and it’s a bugger of a hill, basically up and over Ditchling. Lactate was coursing through my legs and lungs were burning as we trudged up. We looked longingly at the legs of the 6ft tall man who strode past us, wishing that some sort of tardis would appear and transport us to the top. With all good climbs comes a good view and we weren’t disappointed at the top. We took a rare stationary moment to take in the sight and to realign our crooked backs and legs before trotting off along the ridge and onto a long downhill. Last year my feet were in so much pain that I couldn’t physically run down the hill, this year we sped down it feeling far from fresh but at a good pace nonetheless. We overtook a fair few people in this last stretch and before long we reached the end of the path and had Brighton racecourse in our view. The final 100m is a slight uphill round the racecourse but the sight of the finish was magical. Mark and the kids were there as was Sean’s daughter, Emily, who is an ironman athlete so understands the exhilaration of finishing an event like this. Earlier on in the race when I had slowed and couldn’t see myself regaining any speed, I estimated a finish time of 13-14 hours but, because of Sean, we finished in 12 hours 24 minutes and I am really proud of that! It’s going to be hard to top this race experience even though it was truly a race of two halves, the positive far outweighed any negatives. I feel physically and mentally stronger for it and ready for the rest of the year! 106km round the Isle of Wight in one stage. Ultra Challenge laid on a really great and polished race. I opted to camp at the start/finish line in Chale for a mere £25 for 2 nights. The upside was that I could just wander to the start and could then fall into my tent when I had finished. The downside was that I had to sleep on the floor after running over 100km- ouchie. Considering I was next to the start line, I still managed to be in a massive rush to get there on time. I was so chilled out in my tent that when the 5 minute call to get to the start line was announced, I realised I hadn’t filled my water bottles, gone to the toilet or particularly packed my bag. Nevertheless I made it to the start line on time and met up with Rich from Tri Surrey whose first job of the morning was to go and fill up my bottles whilst I faffed around! I had decided to start out at a decent pace with the goal of getting as many miles under my belt before the inevitable shuffle started. The checkpoints came roughly every 12-14 km apart and were stocked full of delicious food. Keeping the mentality of always moving forward, which I think we have figured out is from Channel swimming(every 10 seconds stopped can add minutes, perhaps hours, onto a swim), I kept my checkpoint stops brief, just picking up a banana and water and then moving on. The runners from the ferry all went off in front of me but by the next checkpoint I was up to 9th and only dropped 3 places to finish in 12th, which I’m pretty happy about. I was under the impression that I was first lady in the race but I was fading fast in the last 20km and was overtaken by Erica somewhere along Shanklin. It turns out she started in a different wave to me(I had thought all runners started at the same time) and so had been running a lot faster than me anyway. We had a nice chat and I look forward to seeing her again at London to Brighton in a few weeks. With 12km to go, I got to the final checkpoint and found Rich with his walking sticks out. He had been dealing with nagging injuries from the outset but had managed to run really well until the final section. He was going to walk to the end. We had a brief chat and I jogged off in front, having a little joke about putting the kettle on. Well, I found out that Rich is rather good at power walking. So much so that I literally couldn’t shuffle any faster yet I kept hearing his voice on the wind, talking to his mate Sam. Finally, with about 2-3 miles to go, they caught up with me. The light was fading fast and we had reached high ground so the wind had a really chilly kick to it. We nattered away for however long it took us to finally see the finish. I think my memory of finishing would have been a bit dismal if I hadn’t met up with the boys, as I wasn’t loving that final stretch. Hoping that they wouldn’t disqualify us for not wearing our headtorches in slightly post-dusk light, we jogged through the finish line, grabbed a glass of bubbly and had a mini photo-shoot. IoW was Rich’s first ultra and he did just amazing; his attitude and ability is just so that I’m pretty sure he could do absolutely anything if he chooses to. We had dinner in the race HQ and I rolled into my tent for a sleepless night. When I woke up in the morning, I walked back down to HQ to see if I could score a free breakfast (sausage bap, oh yeah.) and was just so impressed to see people just finishing, having been walking all night. It really takes some mental ability to go through the night and I’m pretty sure that I couldn’t do it. I had been away for two nights so it was lovely to get back home by lunchtime to see the family and, by the sounds of things, daddy day care had been nearly as exhausting as running an ultra! After feeling a bit ‘meh’ about running Brighton marathon, this run refreshed my mind…. it made me realise that I want to run in beautiful places and talk to interesting people and, ultimately, I want to always have that desire to run and for it never to be a chore or a hinderance. My marathon pb was broken here in 2016 when I ran 4.00.56. In the year since then I have completed an ironman, a 40km ish swimrun, 1 marathon and 5 ultra marathons, as well as quite a few other running races and training runs. I have never consistently run; I tend to enter ultras, run/jog/walk/stumble through them and then rest up until the next one. This year I have tried to target 30miles on average per week. This is not a large amount of mileage for lots of marathon and ultra runners but for me it is manageable with 2 young children and a job as a primary school teacher and I have built this up from very sporadic training so it’s important not to get carried away and get injured. Living in a valley, I run up lots of hills. I live half a mile from the North Downs Way so beautiful trail running is on the doorstep. I have enjoyed trying to get faster and have found my min/mile times tumble from 9 minute miles to 8 to 7. 2 weeks before Brighton 2017 I ran Cranleigh 21 which is a nice, low key, club event. I was really excited to run and I felt that I nailed the race; I ran 7.50 miles pretty consistently for most of the race, tiring slightly in the last few miles but holding a pretty good pace. Cranleigh gave me a lot of confidence and I was buzzing after the race. Fast forward to Brighton and I was feeling really confident for a sub 3.30 time. I started with a friend and we ran 7.50 miles to 9 miles. I hadn’t felt ‘bouncy’ and wasn’t particularly taking in the atmosphere of the crowds like I was last year… I’m not sure if this was because I was hot, feeling the pressure of having a target time or just not having a great day. I have to say that the fitter I have got, the less affected I am by illness, hangovers and tired legs… I can still manage to pull together a decent run so excuses of tired legs don’t really hold true! Back to mile 9 and I had targeted a portaloo that needed my attention at the top of the hill out of Rottingdean. I left Dan with a shout that I would catch him up and ran for a comfort break. Appearing from the portaloo, not only opening the door pretty much into an oncoming cyclist but also then running directly in front of him(sorry!) I continued on down the hill, feeling a bit rubbish; my stomach was feeling unsettled and my legs felt sore and tired… I thought that the further I ran, they might loosen up as they often do. I got to half way and had still managed to stick mostly under 8 min miles but I had given up on my goal of sub 3.30, I just wasn’t feeling good!! The loop around Hove was a bit miserable and I had another toilet break plus some walking sections but continued to try and get calories and hydration in. I overtook my friend Jayne, who had been running a consistent race through my stopping and starting, for the 3rd time and had a quick chat with her. It was her first marathon (which she aced) and it hit me that I was very lucky to be able to make complete sense of how I was feeling and how I had been able to accept ultimately failing my goal before I had finished the race. Once onto the beach front again(around 18miles) I pulled myself together and further lowered my expectations to just keeping running, at whatever pace! The power station section was quite nice as it was a break from the crowds of spectators and I knew once I had reached the furthest point at around 22miles, it was just a short run back along the promenade to the finish. The last few miles were nice because I was jogging along at an ok pace(although down to 8.30) and still going past people. The crowds along the promenade are really geared for cheering on weary runners and the final ‘parkrun’ goes quickly. Into the finish straight and I am weary but happy that I’ve made it under 3.40… I do a final sprint to make sure it is 3.37 and not 3.38 and walk straight through to meet Mark(3.29) Paul Lenaghan(3.10) and Dan, who I ran with at the start, and who had finally got under his 3.30 target! I am so proud to be part of Tri Surrey. We had so many runners, all of whom aced their marathon and the club is such a supportive and friendly environment- well done runners and supporters! I am now hanging up my road shoes and putting on my trails for round the Isle of Wight(70miles) in 3 weeks time, followed by London to Brighton 4 weeks after that… looking forward very much to both.